Cirebon was known as Grage in the past, which came from the word “negara gede” means “great Kingdom” is located in the north cost of Java island, near the provincial border of Central Java with West Java. Another source says that the name Cirebon comes from the words Cai and Rebon, which means water and shrimp in Sundanese. Most of the population back then worked as fishermen, counting their life on the sea. Starting as a small fishing village named Muara Jati in the 15th century, Cirebon grew became a major port in the north coast of Java. At that time many foreign ships had come to trade with the locals and in this port also seen that activity of Islam was growing. The establishment of Cirebon Sultanate in the early 15th century marked the first Islamic rule in Western Java, under the leadership of Sunan Gunungjati, one of the Wali Songo (nine Moslems saints spreading the teachingof Islam in Java). Cirebon played significant role in the early coming of Islam to Java. Its culture was described as Java Pasisiran (coastal) culture, with notable mixtures of Sundanese, Chinese, Arabic-Islamic, and European influences. Thanks to its role as a major port in the past. After taking 2.5 hour ride by train from Jakarta, we arrived in Cirebon railway station which was located right in the city centre. First we headed to Keraton Kasepuhan. It was the oldest Palace where The Sultan of Cirebon lived and we went to the oldest Mosque in Cirebon known as a Masjid Agung Cirebon located on the west side of the Palace. As we arrived in front of the entrance, we were welcomed by a tour guide dressing in a traditional costum who explained the history of this Sultanate while walking around the 25 acre palace complex. The palace was built in 1447 and its architecture and interior are a blend of Sundanese, Javanese, Islamic, Chinese and Dutch styles. There were many historical places we could visit in Cirebon which were evidence of the early coming of Islam. Entering the palace complex, we saw a Hindu-styled split gate named Gapura Adi. It is similar to the gate of Balinese Hindu temples. 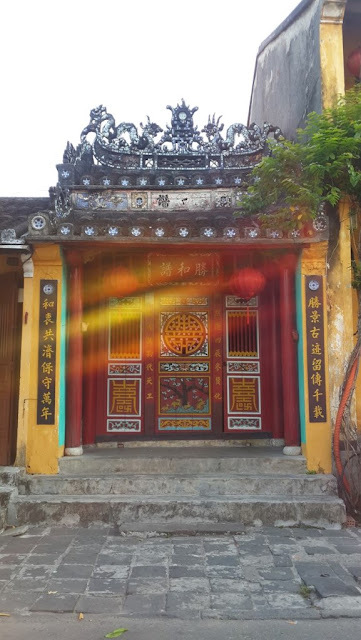 This red brick gate leads you to Siti Hinggil area where there are five wooden pagoda-like pavilions, or we called it as pendopo. Siti means land in local language and hingil means high. This area was built on a level higher than any other areas of the palace to symbolize the divinity of the member of the royal family. These pendopos were built on soft carved brick bases without walls in teak wood columns lined symmetrical with a wooden roof joglo-shaped and tiled floor. The carvings on the pendopo columns were restored in 1940s as a resemblance of the ancient originals. Dating back to 15th century, Pendopo was usually used for gamelan performance during royal ceremony. Like any other ancient kingdoms in Java, the layout of the royal complex must follow a sacred traditional pattern. The Palace has to face north. In front of the Palace there has to be one large central square to house lively traditional ceremony or other public gatherings. To the west of the square, there should be a mosque or other religious buildings. To the north, there should be a jail and to the east, a marketplace. The Palace and the Mosque still stand proudly until today, however the square looks very much abandoned and both jail and market had long been vanished. 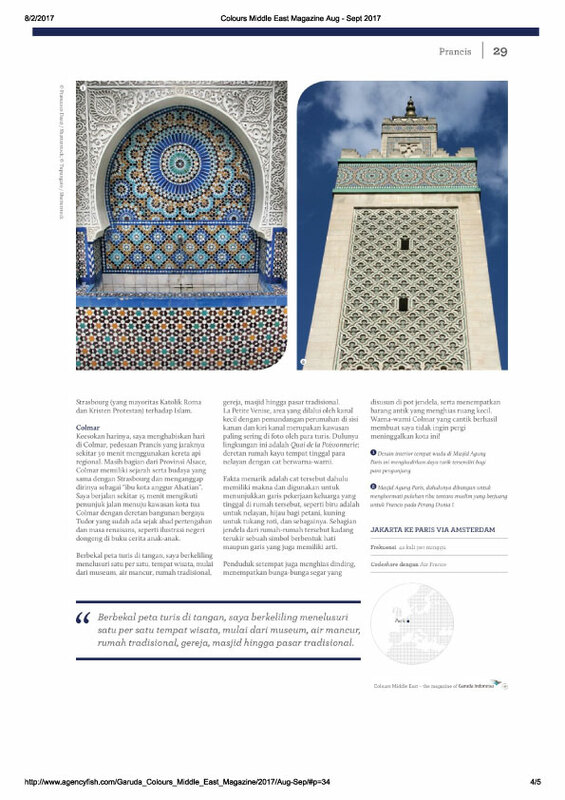 Throughout the 16th and 17th centuries, the sultanate thrived and became a major regional centre of trade and commerce, as well as a prominent centre of Islamic learning. The sultanate then split into three royal houses in 1677, and a fourth split off in 1807, each with their own separate lines of descent and kratons; Keraton Kasepuhan, Kraton Kanoman, Keraton Kacirebonan, and Keraton Keprabonan. Today they remain, performing ceremonial duties. After spending 20 minutes on pendopo area then we entered the palace complex. We can see beautiful and well maintained small garden in the middle of courtyard with two white tiger statues that are the symbol of Pajajaran. Not only that, there are also two canons on both sides. The palace also has a somewhat neglected small museum. On the left side there was an old horse carriage museum that was said to have the prettiest and most sophisticated carriages in the world in its day. A beautiful 17th century gilded horse carriage called Singa Barong may be seen along with a modern duplicate carriage used on official occasions. On the right side, there was a museum with display of wayang, kris, cannon, furniture, Portuguese armour, and ancient royal clothes. Inside is a pavilion with white-washed walls dotted with blue-and-white Delft tiles, a marble floor and Green painted ceiling hung with French chandeliers. These decorative ornaments were evidence that once upon a time Cirebon was a major trading hub in the north coast of Java. While in the living room, there were king's throne and the bedroom. Once we finished enjoying the palace, we immediately walked to the Royal Mosque of Cirebon. Although this mosque was known by the name of The Great Mosque of Cirebon, the actual name is Sang Cipta Rasa Mosque. This mosque was built by Sunan Gunung Jati and Sunan Kalijaga in the 15th century, in 1480 along with the spreading of Islam in Java by Wali Songo with the architectural style that combines the style of Demak, Majapahit and Cirebon. The mosque entrance is surrounded with red brick wall. The mosque is divided into two parts, the semi-open hall and the main room. At the hall, there is an old sacred well that are still in use by people to take ablution. I was amazed that all the pillars in the mosque's hallway were connected without the use of nails, which connects the pegs. 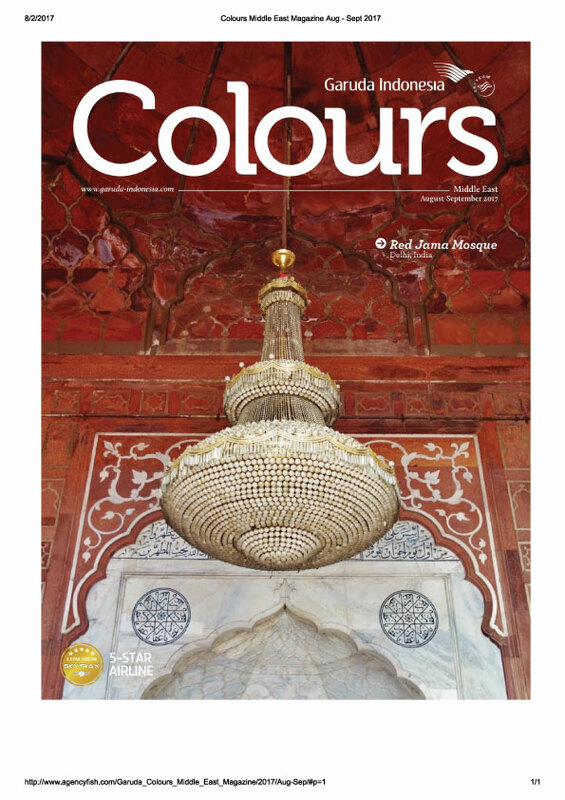 There are nine entrance doors to enter the main room of the mosque from its hallway. This number represents Wali Songo and uniquely all doors are not in the same size, between one and two meter high. Once we go inside, we found the height ceiling right below the roof. The four main pillars called Saka guru were made from solid wood, still stand firmly without any renovation. Like any other mosque built in the early coming of Islam in Java, this mosque has a pyramid-shape roof built in three layers, called limasan. The pattern of Batik Cirebon is the result of a perfect collaboration between religions, arts, cultures brought by various ethnics and nations in the past. 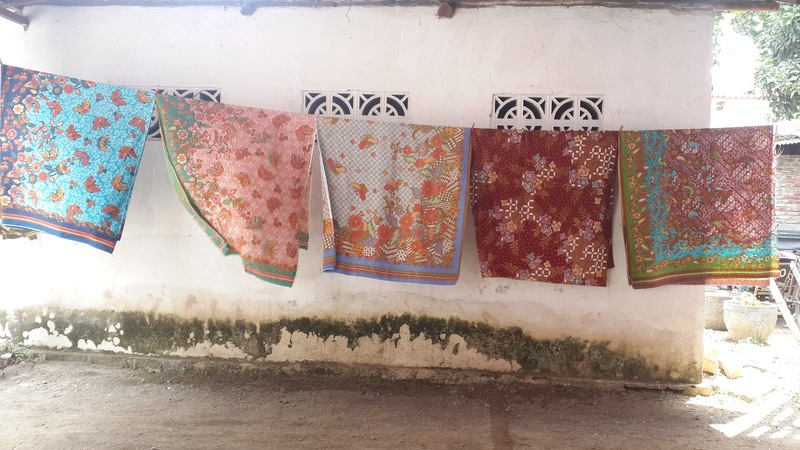 As a major trading hub during 14th century, Cirebon attracted foreign traders from China, India, Middle East and Portuguese which later enriched a mixture of diverse cultures and produced many new traditions such as Cirebon Batik. Unlike other Batik producing-regions that feature one distinct style of Batik, such as Batik Keraton (Royal Batik) for Solo or Pekalongan that focuses on Batik Pesisir (Coastal Batik), Cirebon features both styles of batik. Cirebon’s classic royal batik style has also been developed by the Royal Palaces (The Kasepuhan and the Kanoman Sultanates), while the coastal batik emerged from trade and fishing communities who brought their own motifs and style. Royal batik Cirebon is characterized by motifs of royal symbols based on religious philosophy, while coastal batik Cirebon is more dynamic and open to current trends. In general, the ornaments of Cirebon’s batik can be classified into 5 groups: Wadasan, Geometric, Pangkaan (Buketan), Byur, and Semarangan. Wadasan is the classic ornament of Cirebon batik that mainly highlights the royal batik style. The motifs of Wadasan are among the most renowned of Batik Trusmi that include the Mega Mendung (Clouds), Singa Payung (lion covered by umbrella), Naga Saba (dragon), and Taman Arum, which motifs are largely influenced by Chinese empirial designs. The geometric ornaments mainly feature lines and geometric shapes, among the geometric motifs are; Tambal Sewu, Liris, Kawung, and Lengko-lengko. The Pangkaan is also known as Bungketan ornaments feature floral variations such as trees or flowers. Motifs included in this ornaments are Pring Sedapur, Kelapa Setundun, Soko Cina, and Kembang Terompet. The Byur is highlighted with flowers and small leaves that completely fill the textile with motifs such as Karang Jahe, mawar Sepasang, Dara Tarung, and Banyak Angrum. The Semarangan Ornament features repetitive motifs placed in certain patterns. The motifs of these ornaments are called Piring Selampad, Kembang Kantil, and more. All these Cirebon’s Batik is centralized in the village called Trusmi, named after Ki Gede Trusmi, a man who introduced the art of Batik to local people while spreading the teaching of Islam in the 16th Century. Today, Ki Gede Trusmi remains very highly honored by the local inhabitants. His tomb is well preserved and every 4 years, the Trusmi villagers conduct a ritual called Ganti Welit and Ganti Sirap (changing the roof of the tomb). I become realize that Cirebon is rich with of the glories days of Islam in Java, too bad it’s almost forgotten. 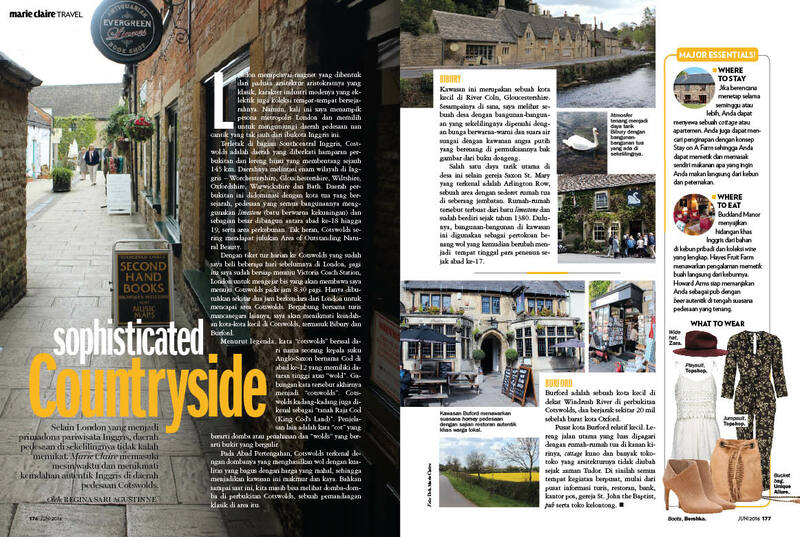 England is not only always about London, there are many other cities that can be visited by tourists, even some of the small towns have a fairly thick British culture. Traveling around the UK from the southern city to the northern part is a must while having the opportunity and time. 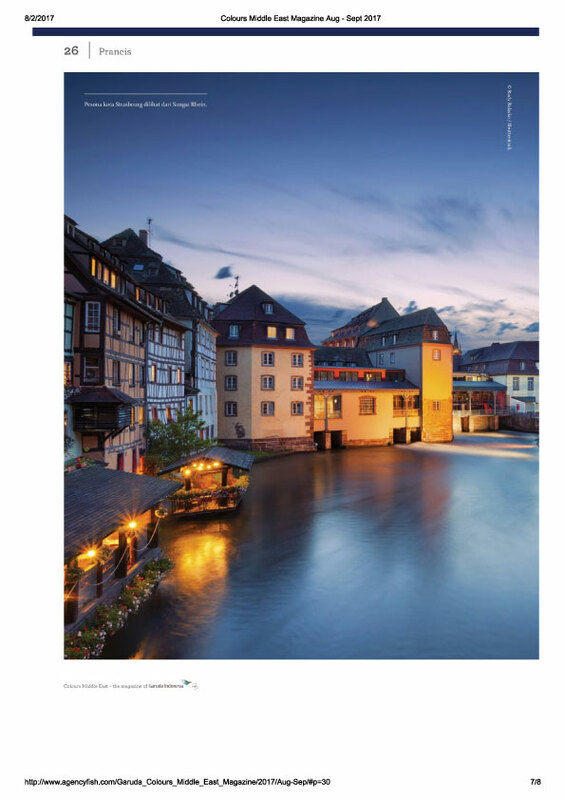 The distance between cities that can be reached via road trip by car or inter-city bus or train makes things easier. Every city in the UK has its own uniqueness so it's a shame if you miss, and the traditional English atmosphere will be felt when you are in the small town. Some areas of the UK I would visit include Bath, Oxford and Cambridge, Liverpool and York. 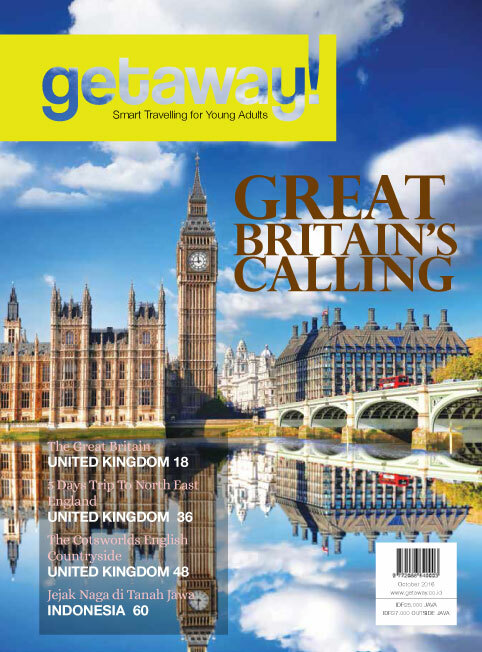 Looking for information about London, is certainly not a difficult thing. 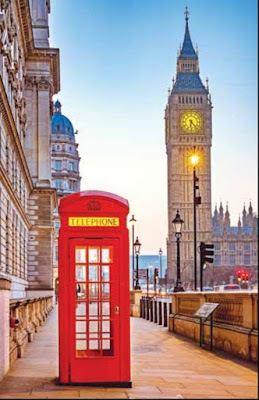 Hearing the word London, definitely all referring to Buckingham Palace, London Eye, Parliament Building, Tower Bridge, Tower of London, and many more. These places are indeed a must-go place if you are in London, especially for those who love to tour the museum and art. 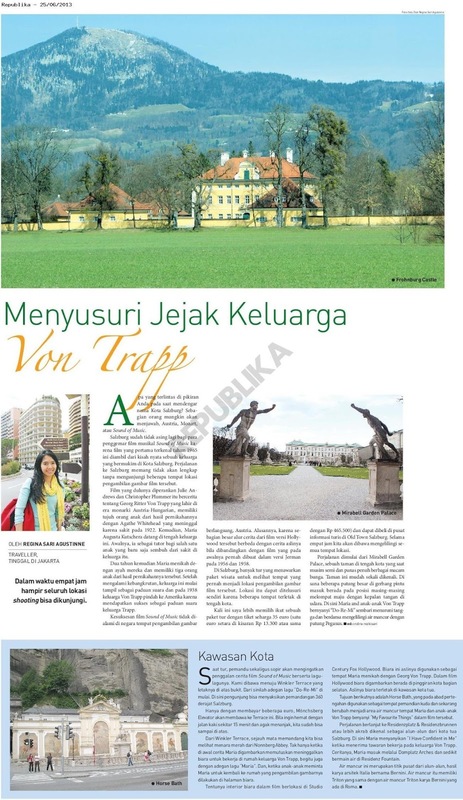 Here you can visit Art Gallery and Museum, from free to the paid museum. London is such a big city that it is impossible to walk around all the places. 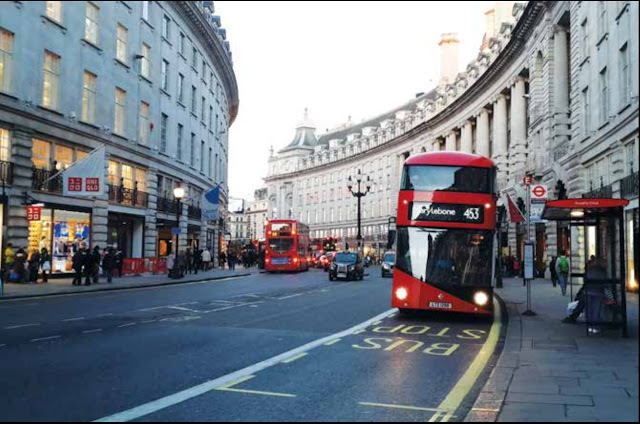 Using public transport such as tubes (London underground) or bus (double decker bus) is a cheaper way than using a taxi. London is one of the pedestrian-friendly countries. 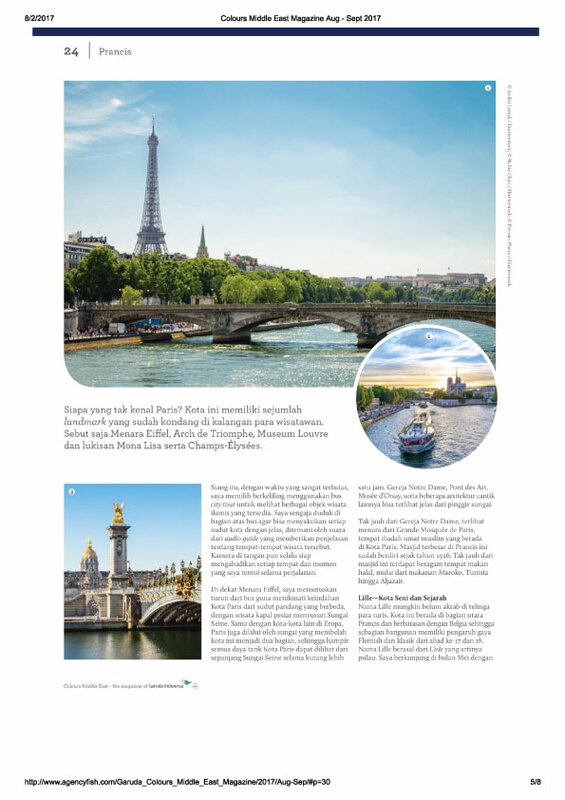 For example, walk on the banks of the Thames while enjoying the beauty of London's landmarks such as Tower Bridge, Tower of London and London City Hall with the backdrop of one of the tallest buildings in the world, The Shark. After enjoying the beauty of London from the banks of the River Thames, there are other interesting places such as: National Gallery where many of the world's famous artist paintings are kept, Natural History Museum, Victoria & Albert Museum, TATE Modern, Science Museum and many more. Enjoy the beauty of the park while enjoying lunch or just sitting in Green Park, Hyde Park, Kensington Garden or St. James's Park also went into the list "been there done" that its London. In addition to being a heaven for museum lovers, London is also a heaven for shopping lovers. The number of shopping centers from high street fashion along the Bond Street, Oxford Circus and Picadilly Circus to designer brands along Old Bond Street, Selfridges to Harrods. Lovers of vintage goods certainly will not miss the weekend market that opens on every Saturday and Sunday such as Portobello Market, Bricklane Market, Old Spittalfield Market. 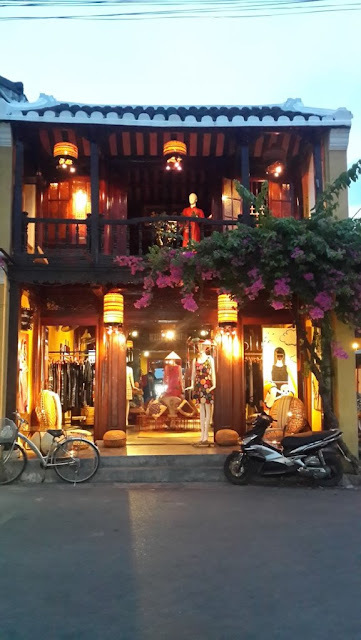 Ranging from handicraft to unique items and used clothes as well as street food you can find it here. For photography lovers, you can capture the beauty of the city of London is increasingly visible from city lights and the hustle and bustle of vehicles that pass on the streets of London at night. We can not buy bus tickets directly to the bus drivers, so all must use travel card or oyster card. English people really appreciate the queue in public places, so do not ever try to cut the queue. All the shops in London are open until 8 or 9 pm (from Monday-Saturday), but for other cities in the UK it is only open at 6 to 7 pm. 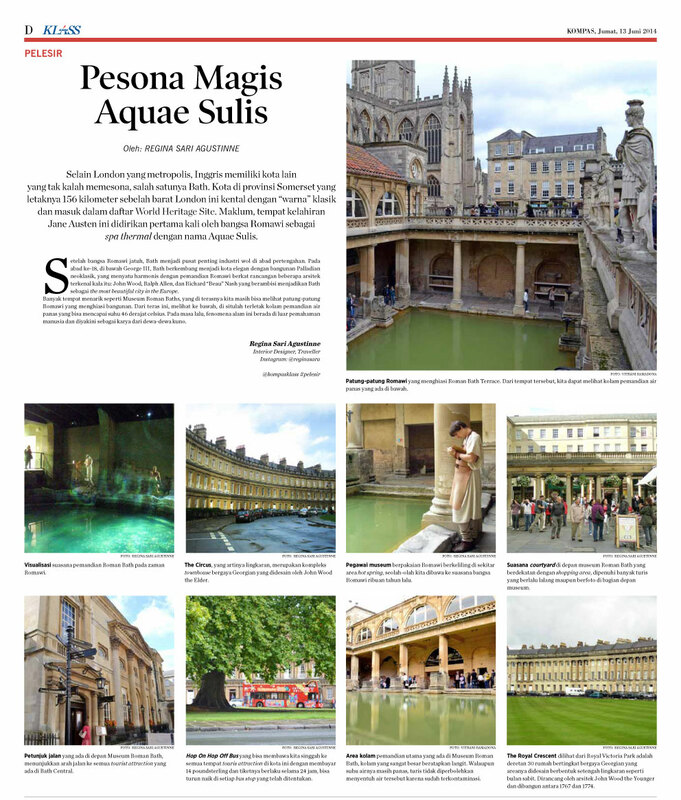 I went on to Bath. 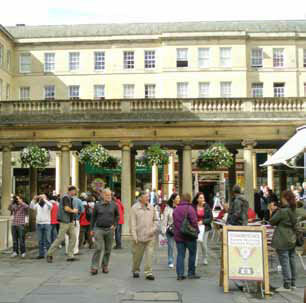 Bath is a city in Somerset County, South West England and is on the World Heritage Site list. 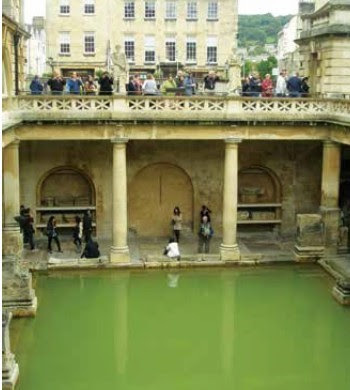 Perhaps some people outside of Europe have never heard the word Bath and do not know where it is, but for those who have read a book or watched a movie about Jane Austen, will surely know it. 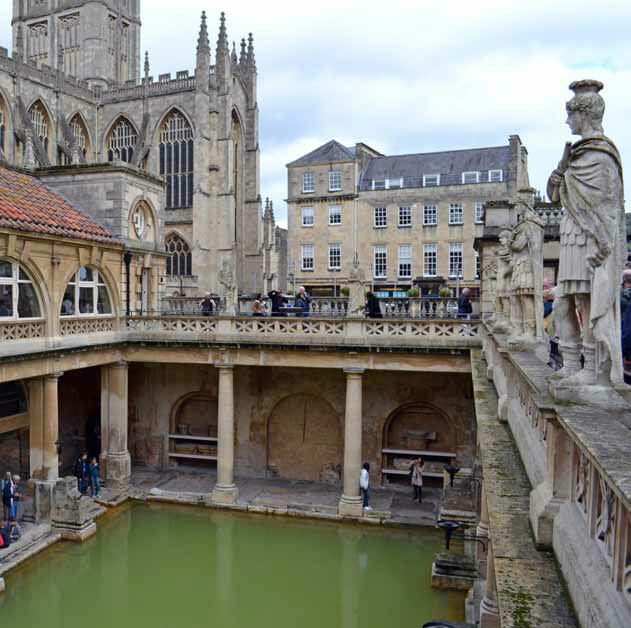 Yes, Jane Austen, a famous writer, came from Bath. 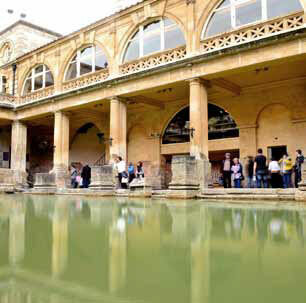 The train to Bath departs from Marylebone Train Station and it takes 1.5 hour to Bath Spa Central. 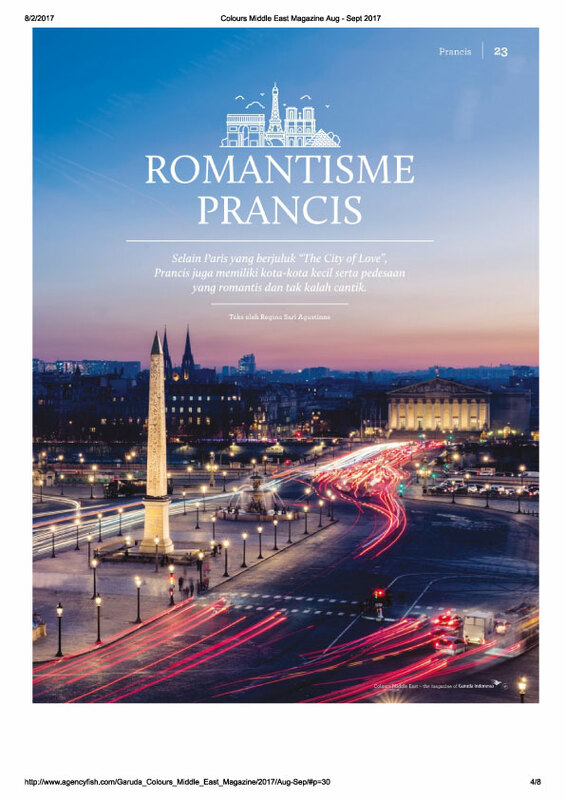 The town is not too big, we only need to walk less than 15 minutes to get to the city centre. 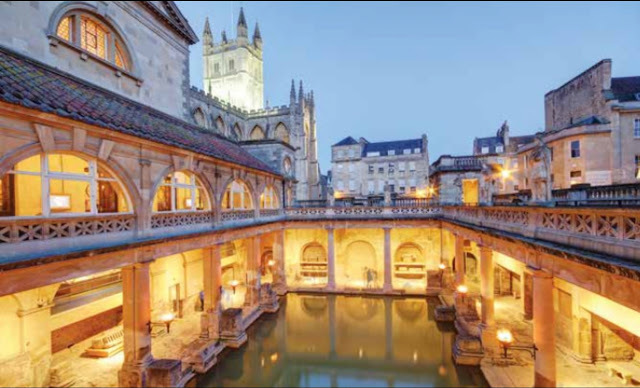 Renowned for its natural hot springs, Bath is home to the Roman Baths. 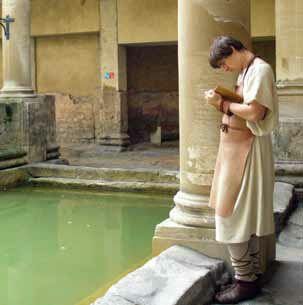 The museum explains all about the history of the Roman baths and the life of the Romans in the past. 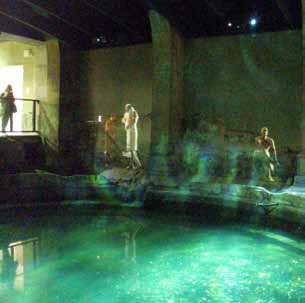 The remains of a hot spring bath is still exist and the temperature of hot water here can reach 46 ° C. I saw museum staffs dressed in Roman walking around the hot spring area, like we were taken to a machine machine back to thousands years ago. 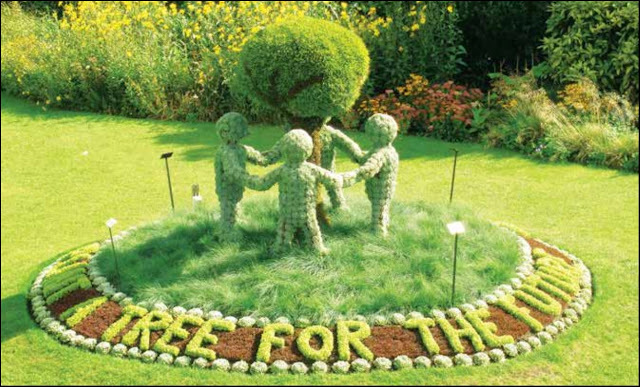 We can also take a picture with them. 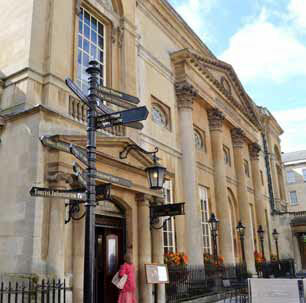 Other places worth visiting here are the Bath Abbey, the Bath Postal Museum, The Fashion Museum, and The Jane Austen Center. 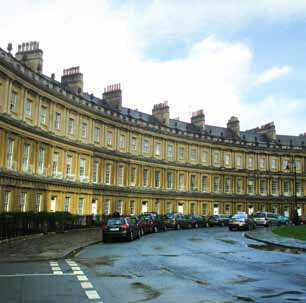 Walking away from the city center, some of the historic buildings that can be seen include The Royal Crescent which is a row of 30 Georgian-style house whose area is designed in a semicircle like a crescent moon and was built between 1767 and 1774 with a garden area of 57 hectares in front of it Royal Victoria Park. 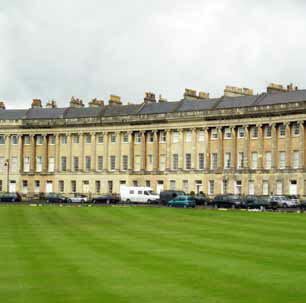 One of the buildings in this complex is the No 1 Royal Crescent, which has been turned into a museum. Not far from here is another row of townhouses, The Circus taken from the Latin, it means a circle. Historically, the inspiration behind the design of this building is the Colosseum in Rome. The complex also has a circular garden and is located in the center of the building complex. Although not as wide as Royal Victoria Park near the Royal Crescent, but the big tree in the middle of the park makes the atmosphere becomes more shady. London Eye : A giant ferris wheel located in Jubilee Garden in South Bank. 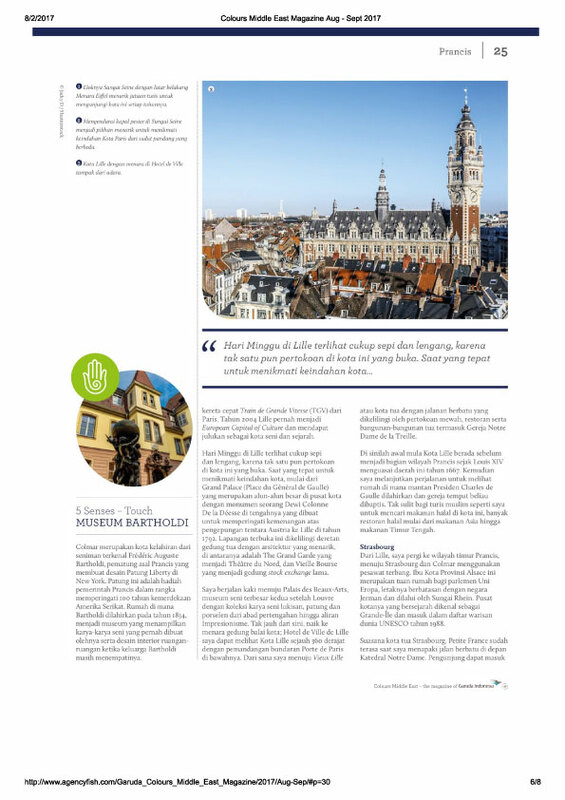 Victoria & Albert Museum : The largest decorative arts museum in the world. 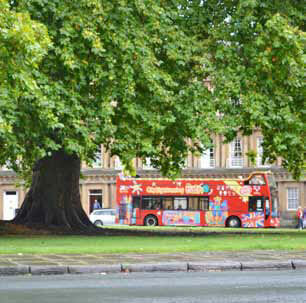 From London, Oxford can be reached for 1 hour 40 minutes by bus or for an hour if using the train. 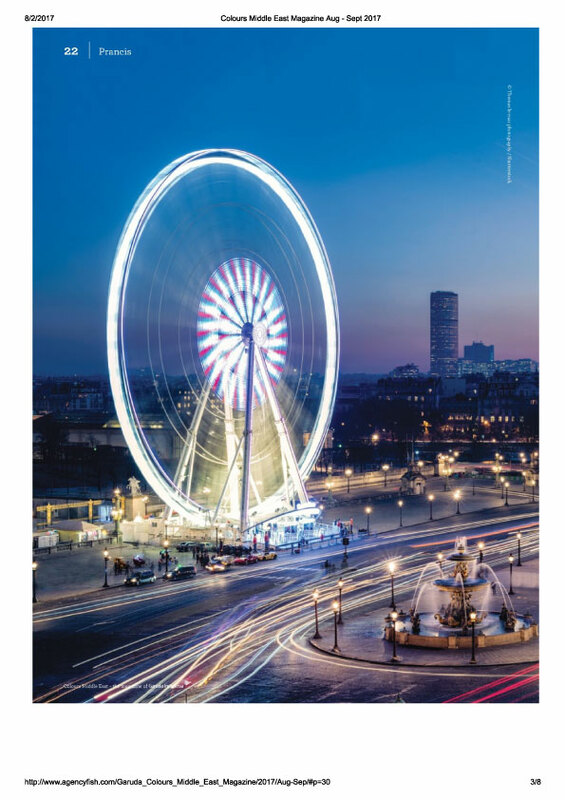 Whatever the transport options, you should buy a ticket in advanced if you do not want to get a higher price. Then, I just walk for less than 10 minutes from the bus station and train station to downtown Oxford. 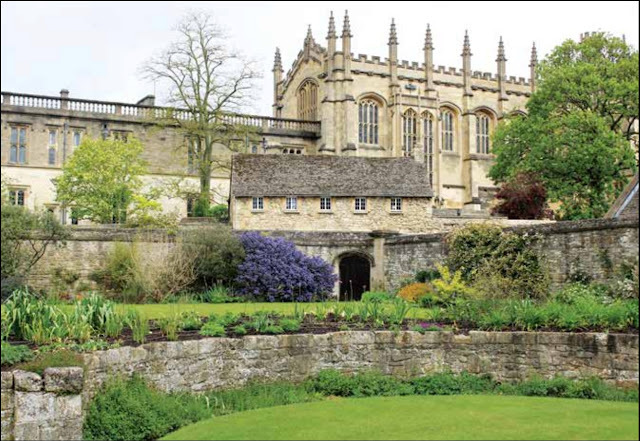 Just like in Cambridge, joining walking tour is the best way to see every corner of the city and the old buildings of Oxford University spread across the city. Remember the movie Alice in Wonderland? The history of this movie story begins in the city of Oxford. So is the lamp-post in the Chronicle of Narnia film, taking the example of one of the streetlights in Oxford; the city whose name is known as the student city. The Bodleian Library is one of Europe's oldest and second oldest libraries in the UK, dating back to 1602, which has seven floors down and one of the rooms in this library, Divinity Hall once used as a filming location for Harry Potter movies; The Philosopher's stone. One of the favorite photo locations for tourists in this city is a bridge that is located on the right side of The Sheldonian Theater. 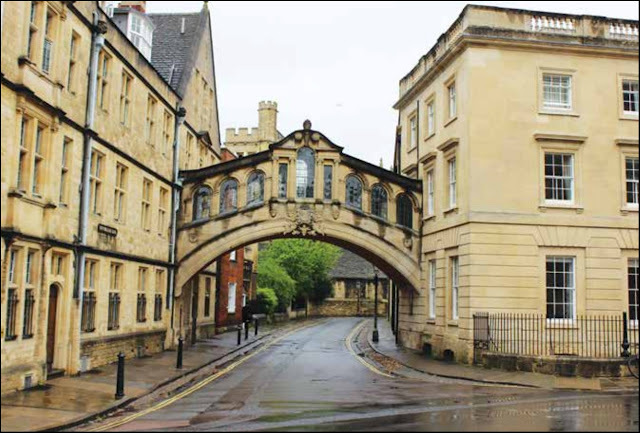 The bridge connects two opposite buildings through New College Lane, between the Hertford College administration office and the student residence from the Hertford campus. Hertford Bridge itself is better known as the Bridge of Sighs because of its resemblance to the bridge and the same name in Venice, Italy. No intention to imitate the bridge, but there are similarities with the shape of the Rialto Bridge that also exist in Venice. Remember the lion detail on the door and the lamp post in the Chronicle of Narnia movie? If you cross the little alley of St. Marry's Passage beside St Mary the Virgin Church, there is a main door with lion detail in its center which is an inspiration for the writer of C.S. Lewis to make it the door to the land of Narnia in the wardrobe of his storybook. This door is originally part of Brasenose College's architecture. A few steps from the door was a streetlight that inspired the street lamps in the film when Lucy Pevensie first met Mr. Tumnus, who also indicated that the lights marked the beginning of Narnia. 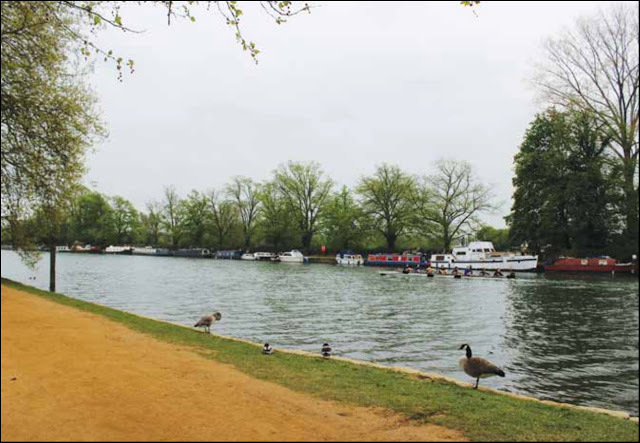 One of the most famous campuses in the city is Christ Church College which has a fairly large yard on several sides to the canals that are part of the River Thames. Some of the rooms on this campus have been the filming location of Harry Potter movies, among them; The stairway; when Harry, Ron, Hermione and others in 'first year', they walk up the big stairs to Hogwarts to meet Professor McGonagall under the majestic gothic domed roof. In addition, The Great Hall was changed to Hogwarts Dining Hall in all Harry Potter movies. There is also The Cloister (the monastery), the place where Hermione showed Harry a trophy when his father triumphed as a hunter in Quidditch. Unfortunately when I was there, all the rooms could not be visited because they were being repaired. Some of the settings in the Alice in Wonderland story are also inspired from several locations on this campus area. One of them is a park called Cathedral Garden in the campus area. It has a small wooden door on a narrow stone wall between a campus park and a church park that is told as a small door behind a curtain, which is in the hallway to the "wonderland" in Alice's story. There was a shop across from the Christ Church campus, which was not too big with a red door with the number 83 on the door and written Alice's Shop. This store is not to be missed because here are all souvenirs related to Alice in Wonderland story. According to the story, the store is a store where Alice and her siblings love to buy candy. In addition, the store is described as a grocery store with an old sheep as a shopkeeper in Alice's story "Through the Looking-Glass". The city that is the background of the movie Theory of Everything about Stephen Hawking is a city where the world famous figures ever attended school. Located in eastern England and crossed by the 64-mile River Cam along the back of the campus which is a building with this architectural style of the past offers a unique blend of traditional and modern culture. 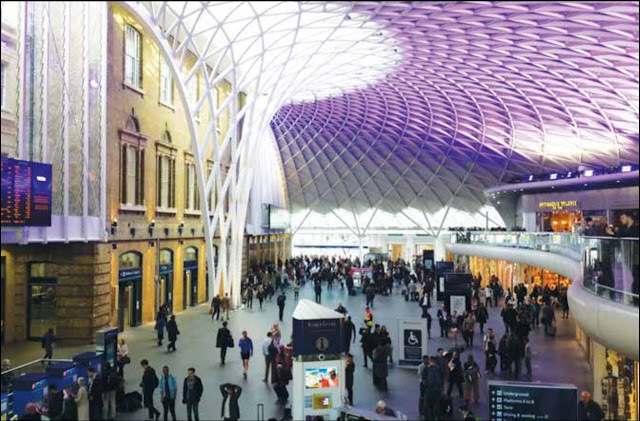 It only takes about 1.5 hours by train from London to arrive at Cambridge Central Station. 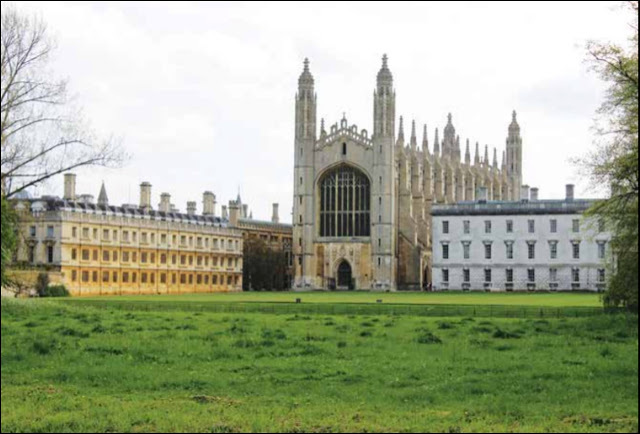 Following the punting river cruise and joining the free walking tour are activities to do while in Cambridge. Sitting on the boat for 45 minutes across the Cam River enjoying the magnificent views of Cambridge city with views of the eight backs of the campus and seven well-known bridges. joining a free walking tour is the best way to see every corner of this city. 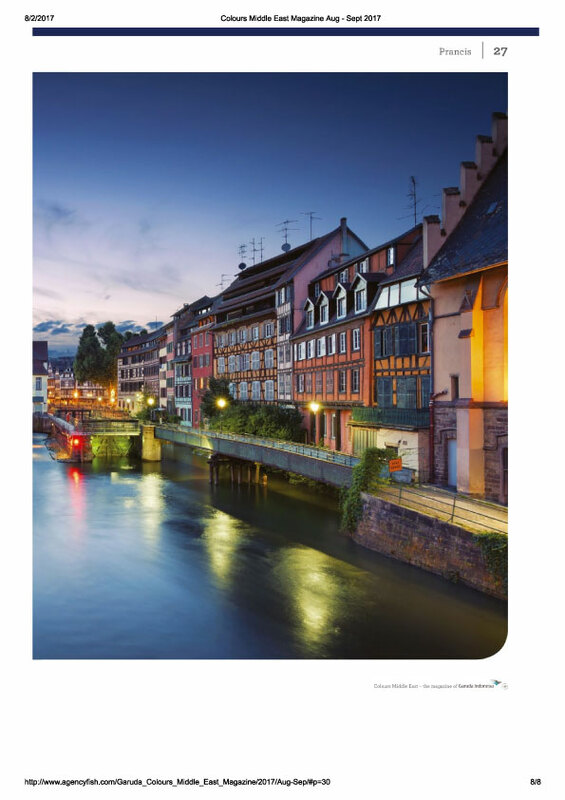 Traveling for about two hours while being guided by a part-time student from Cambridge University is very exciting because it is delivered in a language style that is easy to understand and occasionally interspersed with jokes that make the tourists laugh. Passing every corner of the city street, the buildings and campuses of Cambridge University scattered throughout the city each have stories and history behind them. Not all campuses can be visited freely, some can only see the front page or the main gate only. The train to Liverpool takes approximately 2.5 hours from London and arrives at Liverpool Lime Street Station. 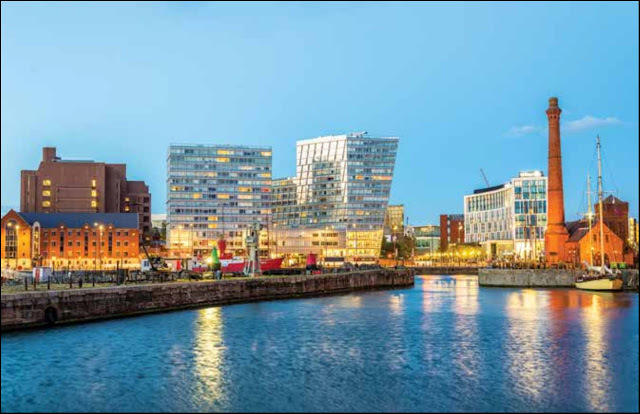 Liverpool is located in the Merseyside area which was once a port city with many foreign ships from European Countries anchored in the harbor of Albert Dock. According to the story, most crew of the Titanic ship is a native of the city of Liverpool, often referred to as the 'scouse' of British society. In addition to port, Liverpool is also famous for its football club that is Liverpool FC and Everton FC. 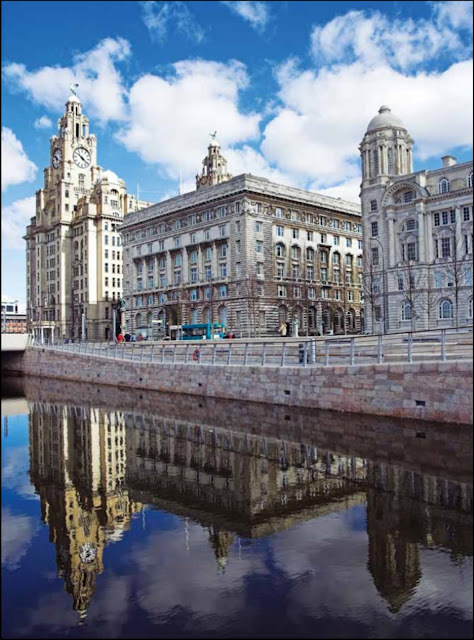 Once out of the station, already seen a few buildings ranging from the St. George's Hall, Empire Theater and several museums such as Walker Art Gallery and World Museum Liverpool are located close to each other. Try walking about 20 minutes from downtown Liverpool to Albert Dock Liverpool which has now been transformed into a family recreation area with restaurants around it as well as galleries and souvenir shops for tourists to buy knick knacks for souvenirs. There are also several museums worth visiting here: the Tate Museum of Liverpool, The Beatles Museum, the International Maritime & International Slavery Museum. In addition, interesting attractions such as the Liverpool Eye, The Yellow Duckmarine Tour and The Beatles Magical Mystery Tour will take us around the city of Liverpool to see the historic places of the band The Beatles for approximately two hours like to see the home of each personnel, Penny street Lane is famous in one of their title tracks, as well as the Strawberry field that inspired the band The Beatles to compose songs of the same title. Listening to the stories spoken by the guides from this tour, as well as the secret stories of The Beatles music group. The tour ends at The Cavern Pub, a small underground club where the Beatles band performed for the first time in this club, a club that is still used by musicians from England and other parts of the world to hold concerts. Outside of the Cavern Pub, I can see a list of the names of artists who once held a concert here. If lucky, maybe I can see Sir Elton John in this club. The journey to York from London is taken for 1 hour 48 minutes. Arriving in York, there is the National Rail Museum which is about 10 minutes walk from the station. This museum contains a collection of various trains from the 19th century or 20. Here I can see the history of the railways in England and is the largest museum in the UK even in the world. Before entering York city center, there is a large park, Garden Museum which is a 10 acre botanical garden stretching from the Ouse River to the back of the York Art Gallery. Inside are the ruins of the ancient relics of ancient buildings. Mary's Abbey, built in 1088, includes the Yorkshire Museum in which there is the history of the city of York, archeology, rare animal fossils, astronomy, and everything related to biology and geology. 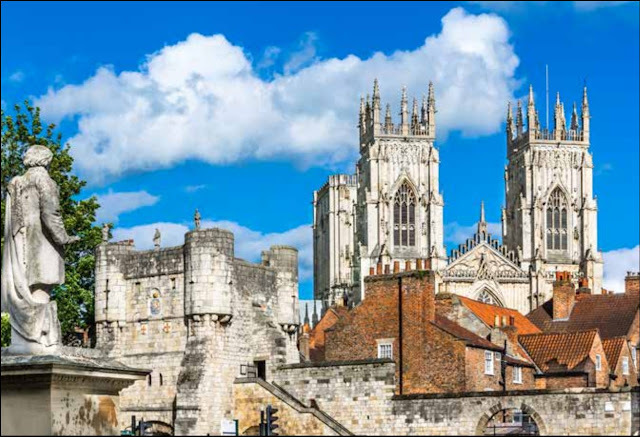 In the city center, there is Yorkminster Cathedral, one of the oldest and largest churches in England and in the world built between the seventh and 11th centuries during the Anglo Saxon occupation. Until now, this church is still used and often visited by the royal family to perform mass with the surrounding community. Visitors can feel the splendor of Yorkminster by paying a £ 15 entrance fee which I feel is commensurate with the sights inside Yorkminster which amazed me for its architectural beauty. I could also see the whole city of York from over Yorkminster Tower. 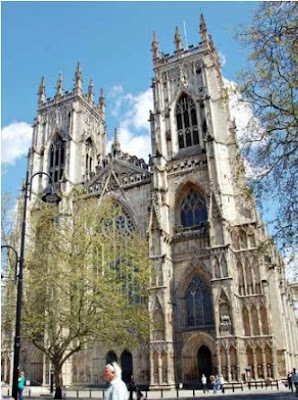 Apparently my arrival to Yorkminster was very precise, because shortly after I left Yorkminster, an Inauguration was made from the Yorkshire Regiment by Prince Andrew, Duke of York, third son of Queen Elizabeth II. 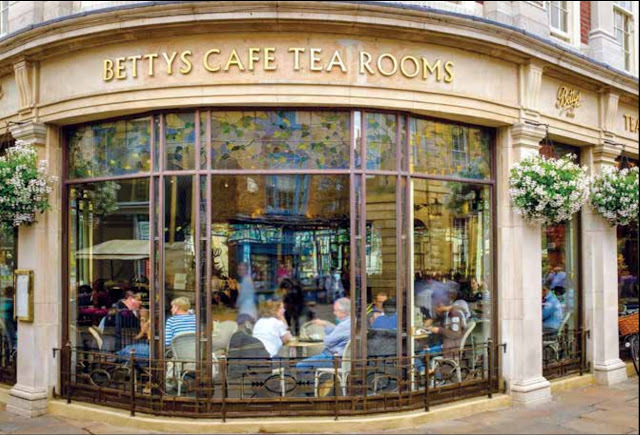 Not far from there, a long queue was spotted at Bettys Cafe Tea Rooms in between shops. 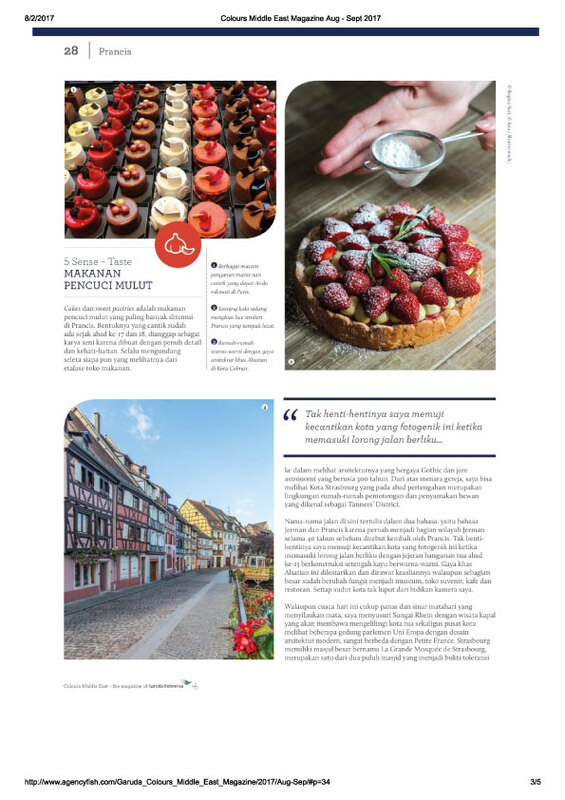 This cafe serves afternoon tea, a tradition of drinking tea in the afternoon of British society while accompanied by snacks such as sandwiches, scones, cake and pastry. 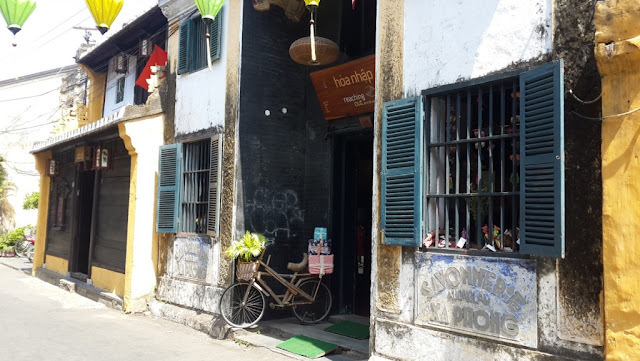 Although always queued, the visitors are willing to wait long just to be able to drink tea at this cafe.